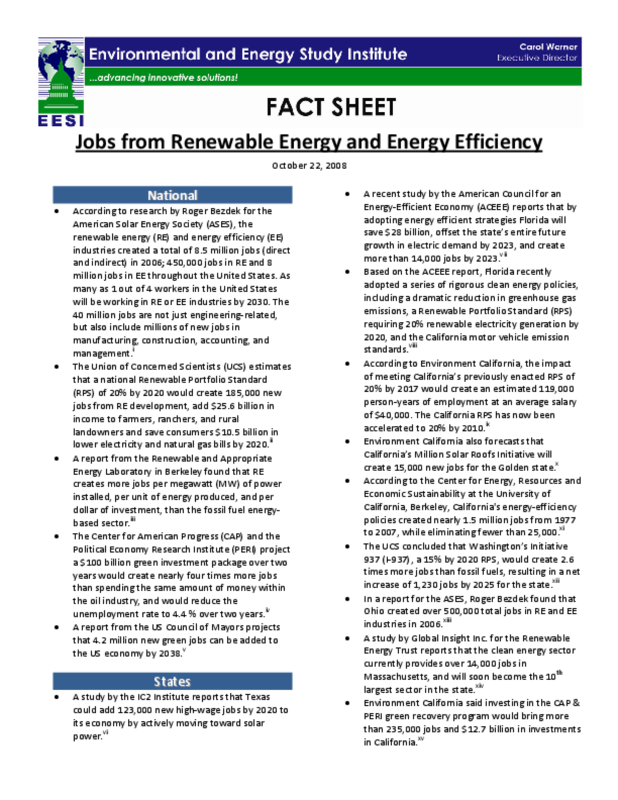 According to research by Roger Bezdek for the American Solar Energy Society (ASES), the renewable energy (RE) and energy efficiency (EE) industries created a total of 8.5 million jobs (direct and indirect) in 2006; 450,000 jobs in RE and 8 million jobs in EE throughout the United States. As many as 1 out of 4 workers in the United States will be working in RE or EE industries by 2030. The 40 million jobs are not just engineering‐related, but also include millions of new jobs in manufacturing, construction, accounting, and management. Copyright 2008 by Environmental and Energy Study Institute. All rights reserved.